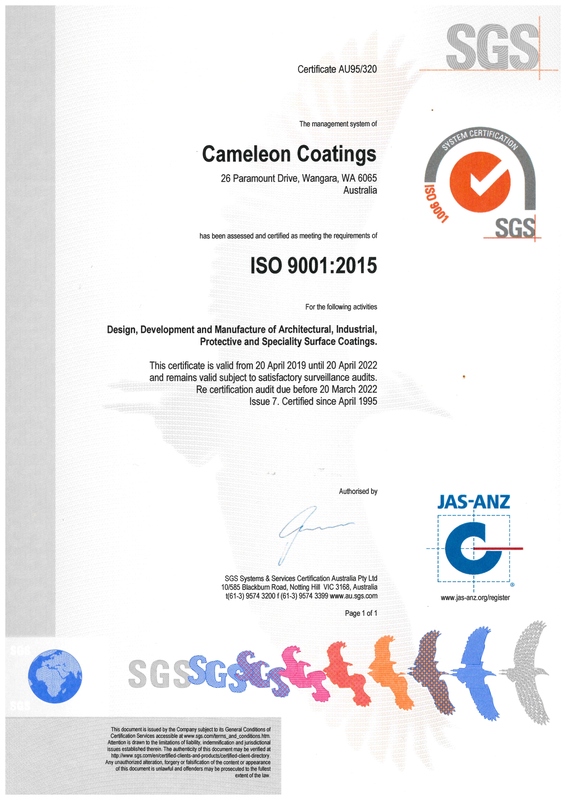 Cameleon Coatings has been manufacturing a wide range of industrial, protective and specialty coatings here in Western Australia since 1989. Cameleon Coatings (the trading name of Red Fire Holdings Pty Ltd, a wholly owned West Australian company) manufactures a wide range of industrial, protective and specialty coatings that are simply beyond the scope of many other manufacturers. Over the years Cameleon has extended it’s products, producing innovative coating solutions to meet the demands of a wide range of industry needs. Their consistent investment in research and development and willingness to customise project specific products has contributed directly to their business growth and success. Cameleon’s technical strength is underpinned by the R&D which started to introduce water based technology, developed specifically for industrial and protective coatings. 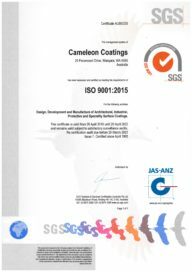 Cameleon Coatings has for two decades (certified since 1995) operated to a quality assurance system which is certified to ISO AS/NZ 9001, and is regularly audited by SGS to ensure conformance with the ISO Standard. Having standards-defined systems in place benefits our entire organisation and gives assurance to our customers that there is consistency, continuity and precision in the manufacture and supply of our manufactured products. QA is more than just a certificate on the wall to us at Cameleon: we firmly believe that the work we put into all aspects of our quality system will realise long term benefits for our customers. Cameleon Coating fully understands that for long term, sustainable success in business we must continually invest in research and development that is both efficient and effective. Over the years we have seen the benefit that our product development has made to our customers by providing new products which can improve processes, save time, offer safer options to applicators and the environment, and ultimately provide cost savings. The ability of developing products that provide real benefits to our customers underpin the success of our R&D program, to do this effectively the entire Cameleon Staff plays a part in the process cycle. Our technical group – consisting of our Managing Director, R&D Chemist, Technical Manager and Production Director – has extensive industry experience and knowhow when it comes to the creation of innovative coatings, and following through with their manufacture. Our sales and customer service team have a thorough understanding of application procedures and field conditions to which the products will be exposed. 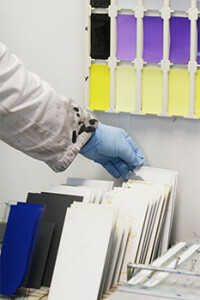 An important part of this process is the relationship we have developed with our raw material suppliers and the understanding we have of the materials that we use to make our coatings. This relationship extends to the ongoing supply of the products that we develop, at a price that enables our customers to easily transition to new technology.